Add new exotic flavors to your menu. Asian Spiced Sea Salt Mix, French Style Grill & Roast Rub With Sea Salt, Mediterranean Spiced Sea Salt Mix, Grill & Roast Dry Rub With Sea Salt. These flavorful blends have a Low Salt content. Assortment comes in a beautiful Clear Vinyl Box. Perfect for a thoughtful gift. Spices are truly the gift that keeps on giving. 10 ounce jar of Low Salt Asian Spiced Sea Salt Mix Ingredients: garlic, onion, ginger, red pepper, sesame, bell peppers, sugar, sea salt, orange peel. 10 ounce jar of "low salt" French Style Grill & Roast Rub with Sea Salt Ingredients: onion, Herbs De Provence (rosemary, marjoram, thyme, sage, tarragon, lavender), garlic, sea salt. 10 ounce jar of Low Salt Mediterranean Spiced Sea Salt Mix Ingredients: garlic, oregano, basil, crushed red pepper, bell pepper, lemon peel, sea salt. 10 ounce jar of Low Salt Grill & Roast Dry Rub with Sea Salt Ingredients: garlic, rosemary, thyme, black pepper, crushed red pepper. Salt Free basics. Every kitchen needs basic blends. These are them. Lemon Pepper Seasoning, Fish & Poultry Seasoning, Everything Bagel Seasoning, Garlic & Herb Seasoning. Assortment comes in a beautiful Clear Vinyl Box. Perfect for a thoughtful gift. Loose leaf Teas are truly the gift that keeps on giving. 8 ounce jar of Lemon Pepper Ingredients: garlic, lemon peel, black pepper. 11 ounce jar of Superb Fish & Poultry Rub Ingredients: Rosemary, Parsley, Dill, Citric Acid,Black Pepper, Garlic, Lemon Peel, Onion. 11 ounce jar of Everything Bagel Blend. Ingredients, sesame seed, poppy seed, caraway seed, flax seed, garlic, onion. Love those Latin Blends but not the Salt? These Blends are 100% Salt Free! All the flavor, non of the Salt. Taco Seasoning, Sazon Seasoning, Cajun Seasoning, Adobo Seasoning. Assortment comes in a beautiful Clear Vinyl Box. Perfect for a thoughtful gift. Spices are truly the gift that keeps on giving. 11 ounce jar of No Salt Adobo Seasoning Ingredients: garlic, oregano, turmeric, black pepper. 11 ounce jar of Cajun Seasoning Ingredients: garlic, paprika, cayenne, pepper, onion. Love those Latin flavors? These blends bring it! Taco Seasoning, Sazon Seasoning, Cajun Seasoning, Adobo Seasoning. Assortment comes in a beautiful Clear Vinyl Box. Perfect for a thoughtful gift. Spices are truly the gift that keeps on giving. 15 ounce jar of Adobo Ingredients: salt, garlic, oregano, turmeric, black pepper. Heat things up. For those that like a little zing in their diet. Hot Paprika, Crushed Red, Cayenne, Hot Garlic. Assortment comes in a beautiful Clear Vinyl Box. Perfect for a thoughtful gift. Spices are truly the gift that keeps on giving. 10 ounce jar of Hot Garlic Ingredients: garlic, cayenne, turmeric. Boost your smoothie (or any drink or dish). These spices are amoung the most popular natural health boosters today. Turmeric, Ground Cumin, Ground Cinnamon and Ground Flax Seed. Add them to your smoothie or morning juice. Take them straight or add them to a dish. Assortment comes in a beautiful Clear Vinyl Box. Perfect for a thoughtful gift. Spices are truly the gift that keeps on giving. Grillers are a special breed and need special blends. These Salt Free Blends will enhance any Griller's arsenal. BBQ Seasoning, Blackening Seasoning, Outback Seasoning, Canadian Steak Seasoning. Assortment comes in a beautiful Clear Vinyl Box. Perfect for a thoughtful gift. Spices are truly the gift that keeps on giving. 11 ounce jar of No Salt Barbecue Seasoning Ingredients: garlic, paprika, celery, pepper, oregano, cumin. 11 ounce jar of No Salt Blackening Seasoning Ingredients: garlic, paprika, pepper, oregano, cumin, thyme. 11 ounce jar of Outback Steakhouse Steak Rub, no salt Ingredients: Paprika, Black Pepper, Onion, Garlic, Cayenne, Coriander, Turmeric. 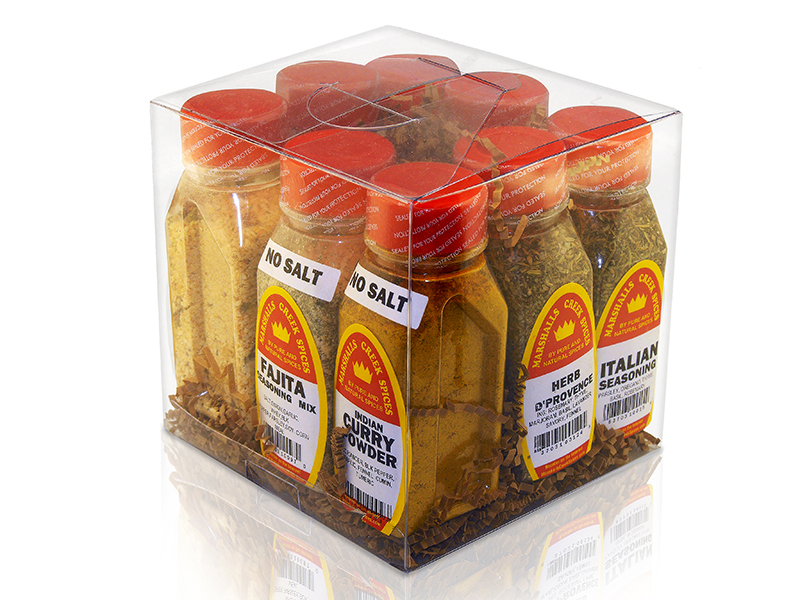 11 ounce jar of No Salt Canadian Steak Seasoning Ingredients: garlic, basil, coriander, onion, pepper, mustard, red pepper. All kitchens start with the basics. These are four of the essentials. Granulated Garlic Powder, Granulated Onion Powder, Parsley, Italian Seasoning. Assortment comes in a beautiful Clear Vinyl Box. Perfect for a thoughtful gift. Spices are truly the gift that keeps on giving. Tea lovers love to brew Tea. This assortment of Teas comes with it's own Infuser. Just add hot water. Chamomile, Tilo (Linden Leaves), Ginger Root, Mint Leaves plus one Stainless Steel Infuser. Assortment comes in a beautiful Clear Vinyl Box. Perfect for a thoughtful gift. Loose leaf Teas are truly the gift that keeps on giving. Tea lovers love to brew Tea. This assortment of Green Teas comes with four 4 oz bags of tea, 4 Tea Storage Containers to keep them fresh and 2 Infusers to brew. Just add hot water. Assortment comes boxed ready to wrap. Perfect for a thoughtful gift. Loose leaf Teas are truly the gift that keeps on giving. Tea lovers love to brew Tea. This assortment of Chai Teas comes with four 4 oz bags of tea, 4 Tea Storage Containers to keep them fresh and 2 Infusers to brew. Just add hot water. Assortment comes boxed ready to wrap. Perfect for a thoughtful gift. Loose leaf Teas are truly the gift that keeps on giving.